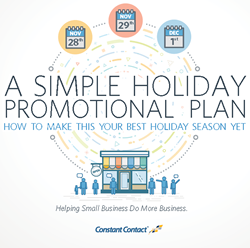 FREE Constant Contact Holiday Marketing Guide! We’re going to show you how to encourage more customers to shop with YOU this holiday season. Today, you’ll set a goal for your holiday promotion and create a great offer to help you reach it. Here’s the best part: You can then use this plan again and again for any special offers or events you run throughout the year.